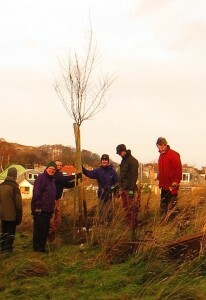 The Friends group planted a new tree yesterday to replace one that died last year. 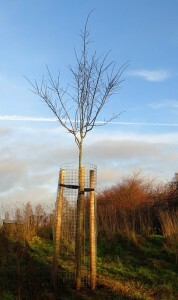 The tree is behind the interpretation panel at the south end of the Park at the top of the wild flower meadow. The tree is a standard Hawthorn (Crataegus prunifolia ‘Splendens’) which has whit e spring blossom and good lea f colour in the autumn. The dense thorny crown will also be a good habitat for birds. Thanks to all those who helped take out the old tree and plant the new one. 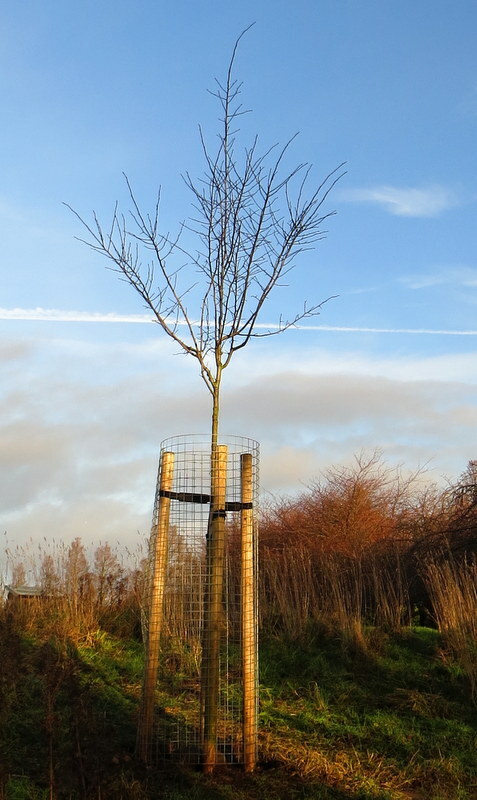 Many hands made light work to plant this large tree complete with ground anchor, stakes and protective cage. We also took the opportunity to plant a few small native hawthorn shrubs, donated by a local resident, in the rough grass at the SW side of the Park to add to the shrubs planted by school children this spring.